The adult beetle is 2-3 mm in length, oval in shape, reddish brown in colour, with a dense covering of yellowish hairs. The biscuit beetle is similar to the cigarette beetle and the furniture beetle in appearance but is slightly larger, more elongate, and has distinctly striated wing covers. 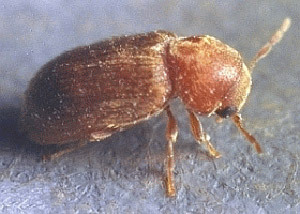 They are also often confused with furniture beetles/woodworm. The young (larvae) of this insect look like a whitish maggot. When full size, they are approximately 5mm in length. Biscuit beetles are found in shops and domestic larders infesting a large variety of dried foodstuffs. They are also found in wild birds’ nests, where they will live on the droppings and debris that accumulate. Biscuit beetle larvae will feed on human foodstuffs such as flour, bread, breakfast cereals, biscuits and other cereal products as well as beverage concentrates, and packet soup mixes. Adult beetles do not feed. Over a period of about three weeks a single biscuit beetle will lay about 100 eggs. This will occur in the foodstuffs or surrounding areas. At normal temperature they hatch within one to two weeks to produce very tiny active larvae, which wander about and enter packaging to infest the foods inside. Development from larvae to beetle takes between 2-5 months depending on conditions, when the larvae will go through four moults. They will then change to a pupal stage which will last between 9-18 days. During this time they will turn into an adult beetle. When the adult beetle comes out of its pupal case (which can take up to two weeks) it will move away from the food source by boring their way through food or packaging, making holes that can look like woodworm, and head towards a source of light (usually a window.) The adult beetle can live up to two months, during this time it does not feed. Any food commodities that are found to be infested with biscuit beetles should be discarded. Other sources of infestation such as birds’ nests and food residues should also be removed, and the area thoroughly cleaned. Heavy infestations in food shops and factories may require professional help. However, light infestations can be dealt with by the use of a crawling insect spray, paying particular attention to cracks and crevices. If you suspect you have a biscuit beetle infestation in Edinburgh, Glasgow, Aberdeen, Dundee or Perth, call GRAHAM pest control today and we could help.